When it comes to in-ground pools, it is the finishing touches that can make or break the pool’s appearance. One of the most challenging aspects of finishing an in-ground pool is the pool coping – the concrete that is used to cap the wall of the pool shell. There are several common challenges that pop up when pouring a cantilevered concrete pool coping, and you will find tips for resolving those issues below. In order to ensure that your pool is seamlessly incorporated into your pool deck, your best bet for pool coping is poured concrete. Unfortunately, there are several ways in which poured concrete pool coping can go wrong, and, if it does, it can have a significant negative impact on your pool’s appearance. One of the most common problems with concrete pool coping happens when the builder pours the concrete up to the lip of the pool rather than pouring it over the lip. When properly poured over the lip of the pool, it is referred to as a cantilevered concrete pool coping. To make a cantilevered concrete pool coping, you need to use a special form that you attach to the lip of the pool and remove once the concrete sets. Pool coping forms are the easiest way to achieve a flawless-looking cantilevered concrete pool coping, but they can be tricky to use. If the builder doesn’t install the form correctly, it could result in a jagged or honeycombed edge, which can be very unsightly. Not only do these mistakes result in a negative impact on your pool’s appearance, but they can be very difficult to repair as well. Unless you are experienced in pouring concrete and you have a high-quality pool coping form to work with, the job may be best left to the professionals. 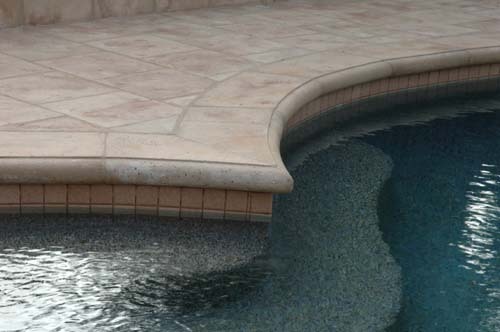 At Concrete Countertop Solutions, we offer several different pool coping forms to help you achieve that flawless look. With our pool coping forms, you can quickly and easily pour beautiful cantilevered concrete pool copings.